The Redondo Beach Pier often has free Concert Series at the end of the Pier. The music is free, open to the public and a great way for families to spend time at the Pier. 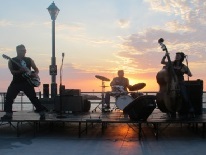 During the Summer the Pier hosts a Summer Concert Series which has free music on Thursdays and Saturdays. For a schedule of upcoming performers, check back on the site and we will update the current music! All pier events are weather permitting, and concert schedule is subject to change.